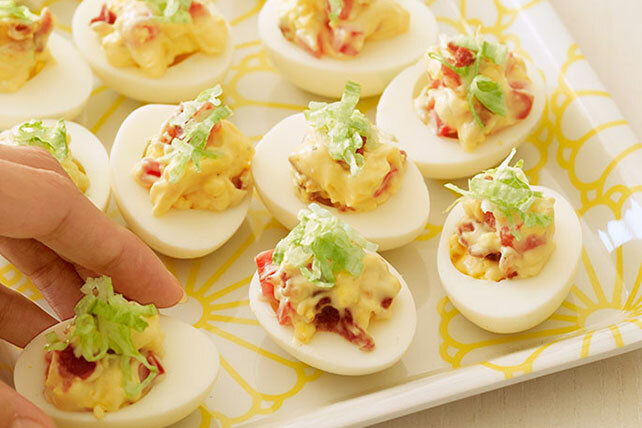 Remember why bacon makes everything better with delicious BLT Deviled Eggs! These 15-minute BLT Deviled Eggs will be the hit on your party appetizer table. Add mayo and dressing; mix well. Stir in bacon and tomatoes. Fill egg whites with yolk mixture; top with lettuce. Prepare using KRAFT Bacon Flavored Reduced Fat Mayonnaise. These delicious deviled eggs can be prepared in advance. Store in tightly covered container in refrigerator up to 24 hours before serving.